Anyone who produces coolant mist and smoke knows the problems that arise if you don't effectively capture and filter it. From oil puddles on machinery and floors to the blue haze and odors across the plant, coolant mist and smoke become maintenance issues and safety & health risks. Micro Air's line-up of mist collectors provide the solution to these issues. Micro Air offers a full line of budget-friendly bag collectors, as well as our line of MISTMAX® collectors featuring new filter technology that provides longer filter life, and better efficiencies. 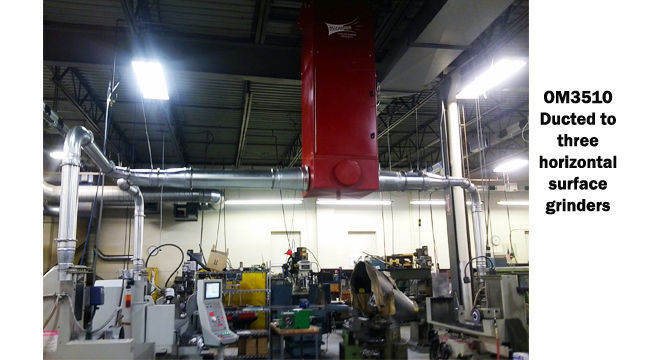 The Micro Air® MM800 MISTMAX® mist collector can be machine mounted and becomes part of the machining equipment. 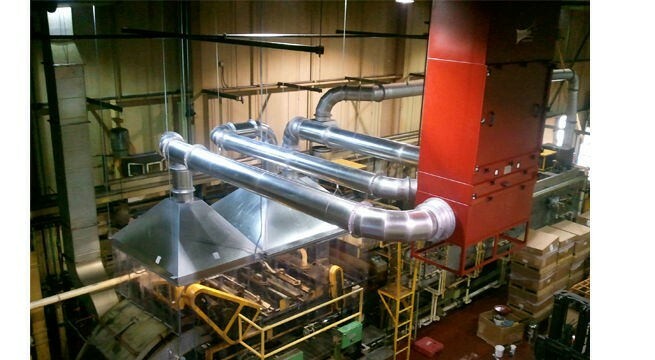 MISTMAX® MM1200, 1200 CFM system ducted to two processes, captures the mist and pollutants, providing clean, safe breathable air and clean floors and work surfaces, all while offering extended filter life, and less maintenance. 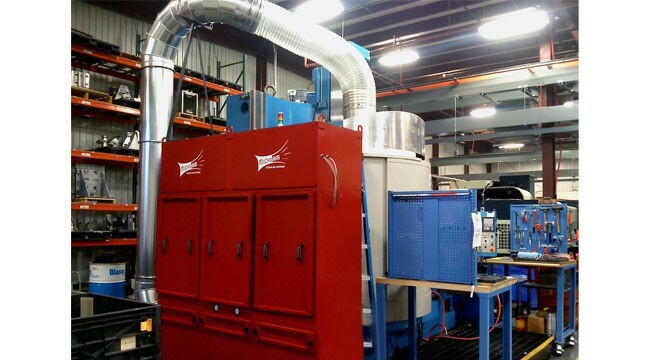 MISTMAX® dual MM2400, mounted back to back, painted to match customer's equipment, and ducted to multiple machining processes, provide 4800 CFM capacities, leaving the room with clean safe breathable air and clean floors and work surfaces. MISTMAX® MM3600, ducted to vertical turning lathe, with crescent-shaped articulating hood, mounted at the operator, effectively captures water-based machining mist and smoke. 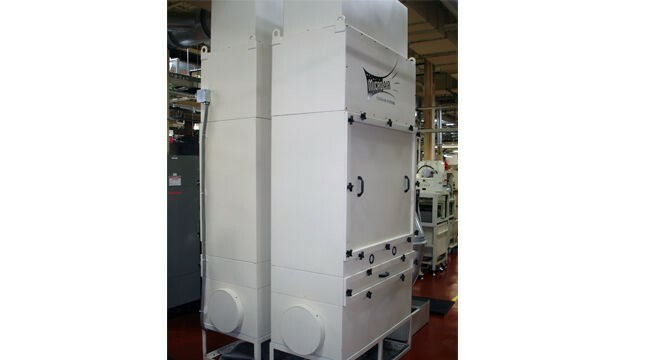 MM3600 features patented MISTMAX™ filter technology that utilizes a combination of Brownian Diffusion (smaller particles randomly combine to form larger, more easily captured particles) and conventional oil mist filtration techniques to provide a highly efficient filter, yet also offers unmatched cost effectiveness in terms of up-front investment, replacement filter costs, and overall maintenance costs of equipment. 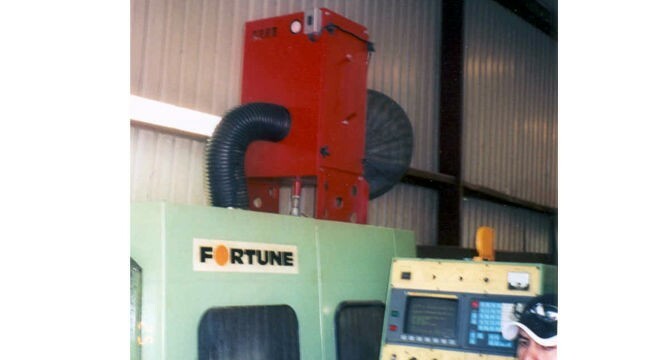 OM550DD machine mounted mist collector captures Oil mist laden air through the front 6” inlet where it is turned 90 degrees to the bottom of the cabinet. The air goes up through the mesh and baffle prefilters and through the 6” high efficiency mist filter. 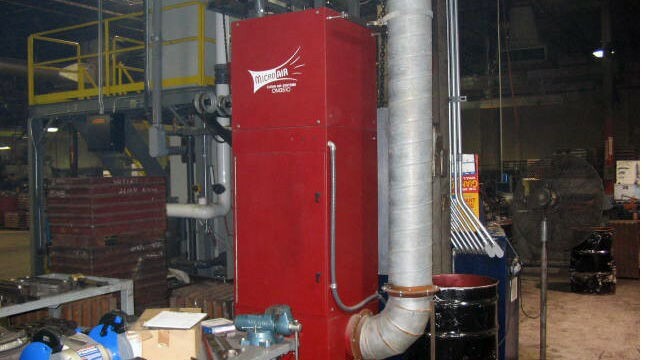 Clean air is then discharged out the front, rear,and left sides near the top of the unit. 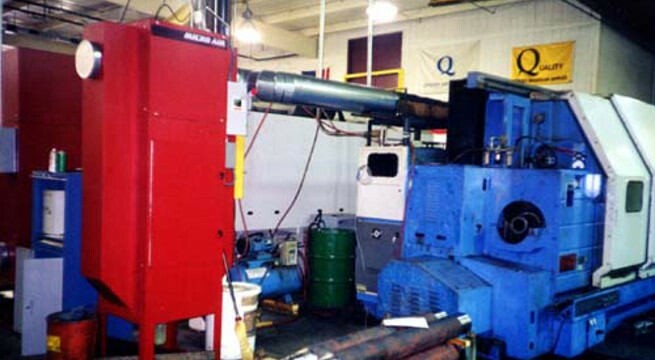 Micro Air OM3510, ducted to machining center is compact and is ideal for space conscious machine shops. 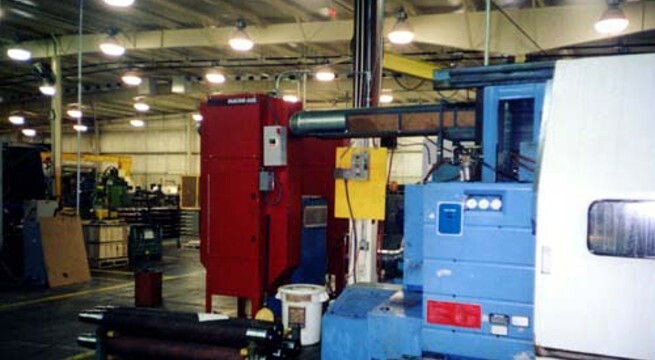 Micro Air® model OM6000 is designed for use in heavy-duty metalworking applications. 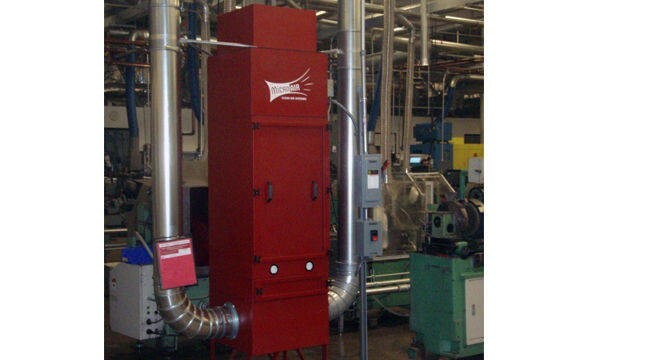 It produces up to 6000CFM, with 95%25 filtration efficiency, and can be ducted to multiple processes. Micro Air's network of factory-trained Engineered Systems Distributors can assess your needs and provide solutions tailored to your particular requirements. 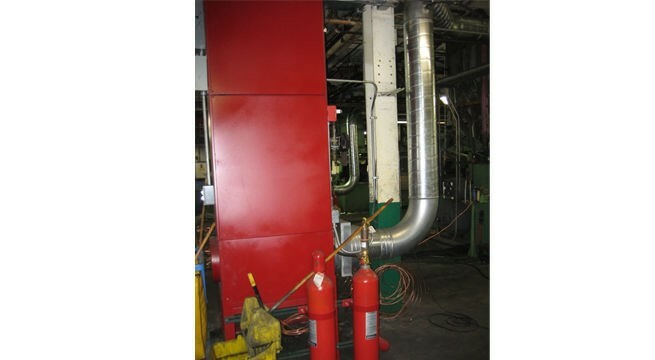 OM6000DD ducted to multiple operations in machine shop collects water-based, synthetic-based or petroleum based coolants, alleviating the problems that airborne coolant mist can cause such as poor shop air quality, PLC boarad damage, mist covered equipment and dangerously slippery floors. The solution to these problems is to control and capture the mist at it's source. 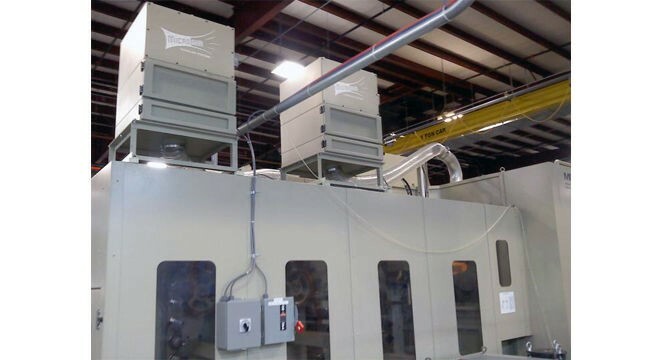 Thirty-four MX6000's, equipped with a 2' Baffle Impinger, 2' Aluminum Mesh Prefilter, and a 95%25 oil mist bag filter effectively capture the coolant mist and smoke in a very large Texas manufacturer's facility. 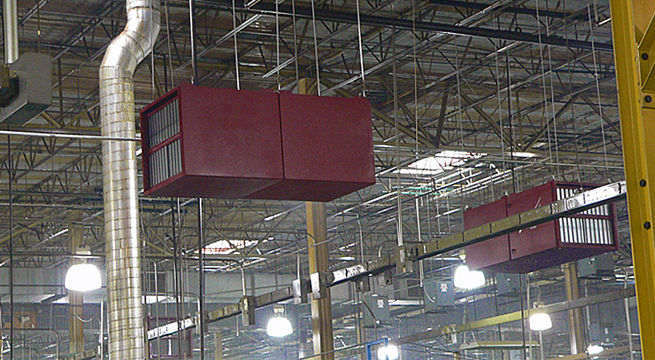 34 MX6000's were installed in a racetrack configuration providing an air change 6.9 times per hour or every 8.6 minutes completely removing the “blue haze“ previously hanging in the air. 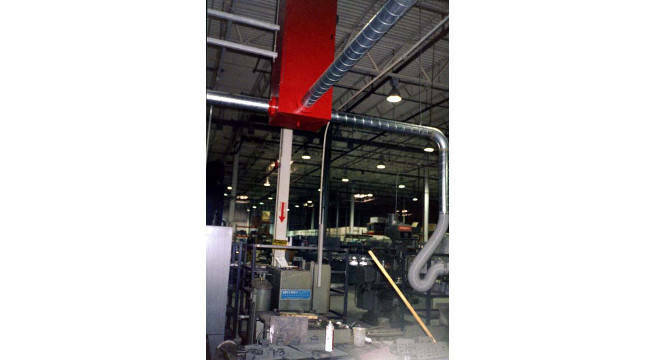 The Micro Air® OM3510 mist collector can be supplied with custom inlet plenums which allow for maximum flexibility. The Micro Air® OM3510 mist collector can be connected to multiple drops. The Micro Air Engineering Staff will assist in designing the duct work to insure maximum efficiency. 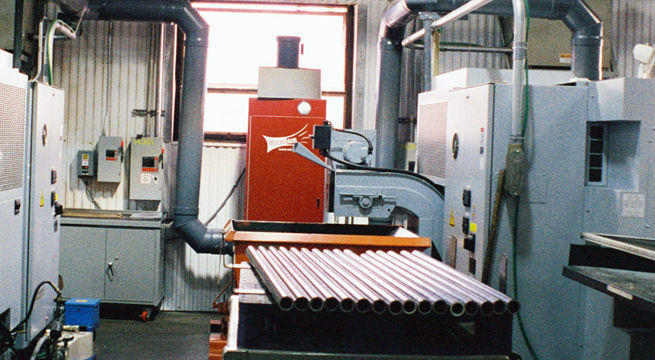 The Micro Air® Mist unit is capable of being connected to a single machine and capped for future expansion. 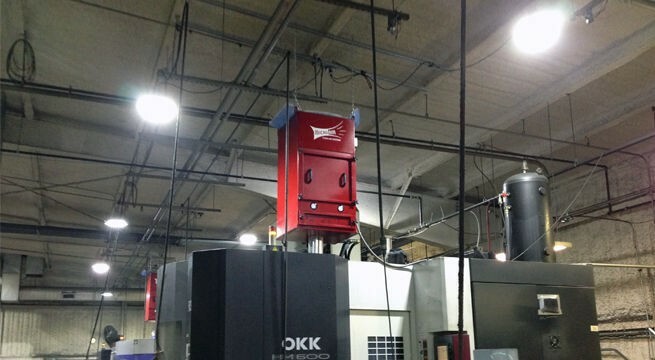 Micro Air® MM800 MISTMAX™ machine mounted mist collectors capture mist generated in Mori Seiki machining center. Micro Air® OM3510, configured with oil mist filtration, and ducted to three horizontal surface grinders collects water-based coolant and stone grit, leaving the shop free of mist build-up on equipment, floors and work-surfaces.